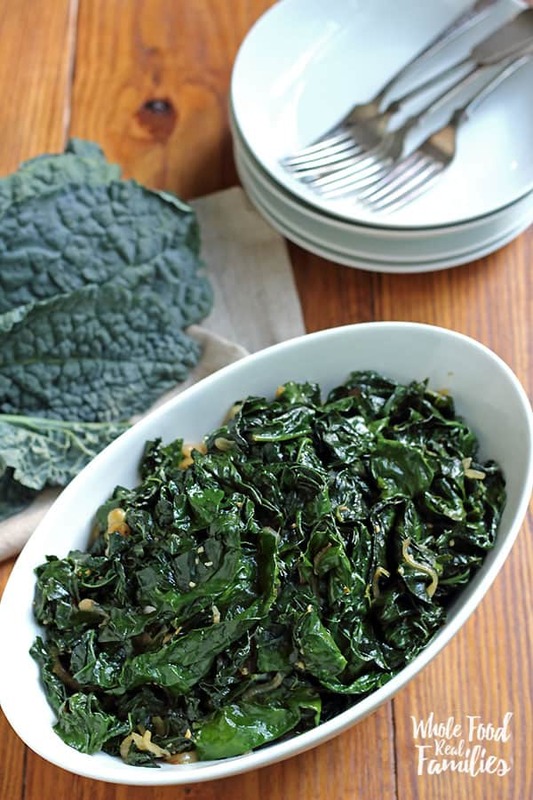 This is the most awesome Sauteed Kale Recipe ever and apparently, you agree! It has been the number one recipes on My Nourished Home pretty much forever. It will convert anyone from a kale-hater to a kale-lover, even my teenager… Learn to choose and prepare kale to remove the bite and keep the hearty flavor and all the nutrition! I have an admission. I am a recovering kale hater. I have always known it was good for me but could never get my taste buds and my brain to agree on a plan for incorporating more leafy greens into my diet. Two important things happened that changed that. Not convinced of the nutritional value of kale? Check out all the details regarding kale nutrition here. Also, most people just wash their kale well, chop it up and cook with it. I don’t love the stalks – so if you are new kale eater but looking for a way to make it work, be a wimp like me and remove the thickest pieces of the stalk before you chop and saute! Also, shallots make everything better. Seriously. My kitchen is never without shallots. I always add just a bit of stock (or water if you are in a pinch) and cover the pan to make sure the stems are tender. My kids actually love this kale recipe, but one stem that doesn’t chew like it is supposed to and all bets are off. One more tip: we actually like to hit the farmers market when kale is in the season. Often there is SO MUCH OF IT that towards the end of the market, sellers will sell it by the box rather than by the bunch. We take it home, wash it and trim it, then blanch it in boiling water, then pile it into freezer bags. A huge box of kale turns into maybe two-gallon bags once it is blanched. Then when I want fresh greens for dinner, we just pull as much as we need out of the bag and it tastes fresh as the day we bought it. I have heard over and over again that this recipe changed people’s mind about eating sauteed kale as part of their regular dinner rotation. 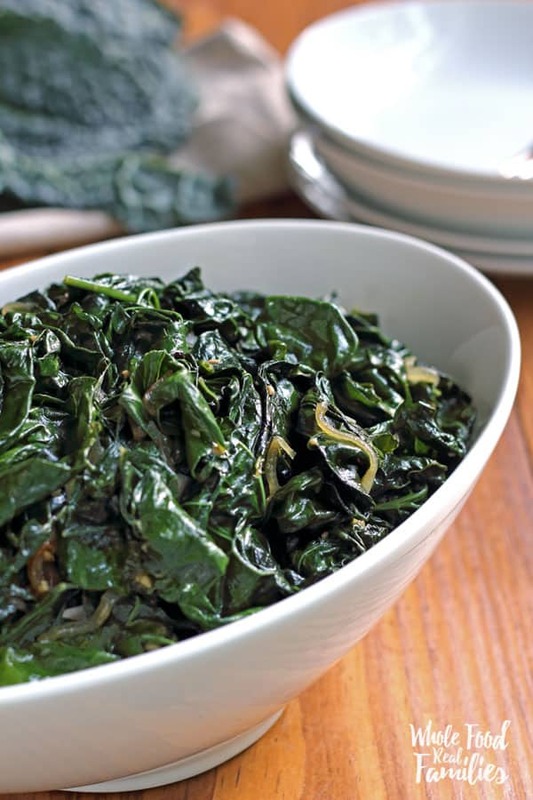 Once your mind is opened to kale, you will be looking for more main dish recipes! 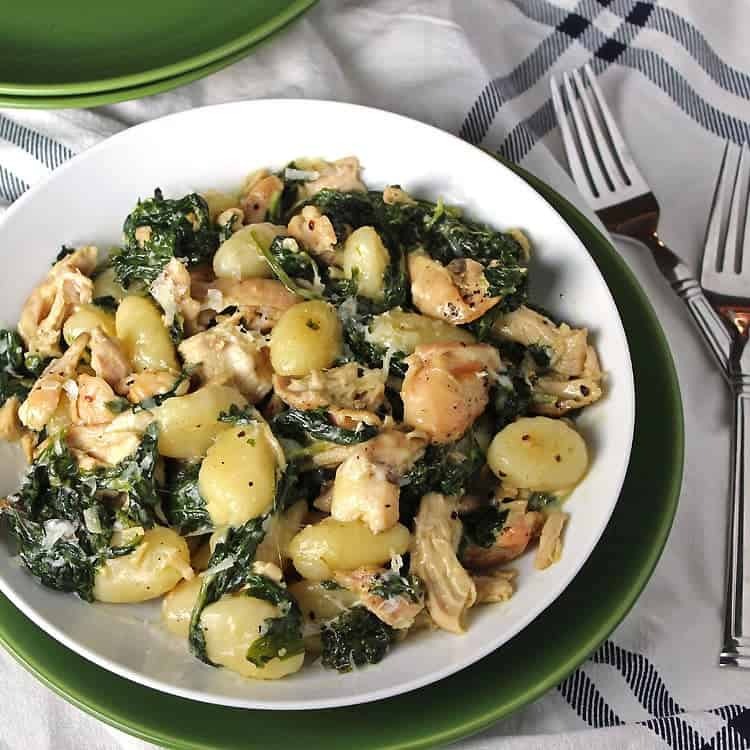 If you are looking for another recipe that will change your family’s mind about kale, this Creamy Chicken and Kale Gnocchi is the BEST. The little bit of cream in the sauce takes all the bite right out of the kale. Kale can be substituted for most leafy greens in recipes. But I trade it out with spinach pretty often. If I am going for a heartier, earthier dish, I use kale. If I am thinking light and fresh, I use spinach. 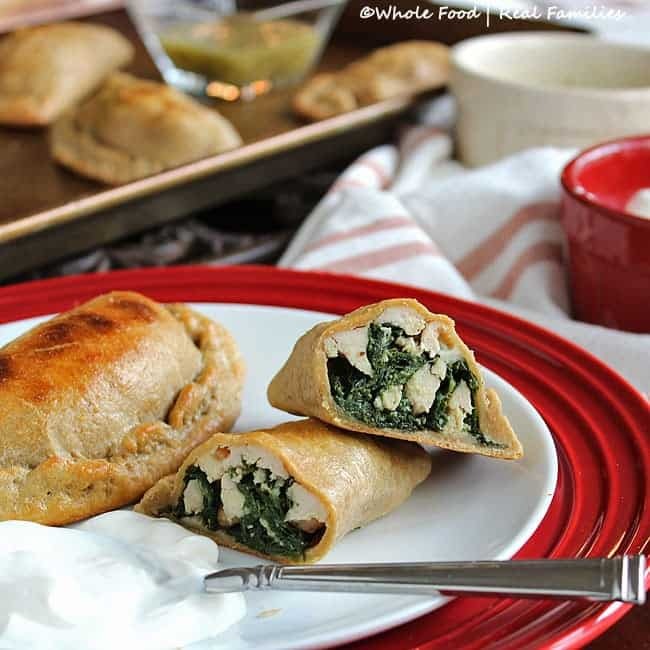 We also love these Chicken and Kale Empanadas! They are awesome to make ahead and freeze, then pop into the oven for a quick dinner or lunch. The short answer is YES! Pile it in an airtight bag or container and pop it in the freezer. You’ll just need to thaw it in the refrigerator then reheat it in a saute pan when you are ready to eat it. The long answer is – I actually prefer to blanch my kale and freeze it without the seasoning or oils that you use to saute. That way, I have the flexibility to use it in a specific recipe once thawed. I have been known to whack a bunch of frozen kale on the counter and throw the block into the slow cooker to add greens to soups. Kale is very forgiving… thank goodness. If you come into a mass of kale that you fear will go bad before you can use it, by all means, blanch and freeze it. It is so easy! Rinse your kale so it is clean, and chop into pieces. Bring a big pot to a rolling boil, add the kale and let it boil for 3 minutes (yes, just 3 minutes!). Use a slotted spoon to remove it and transfer it directly to a big bowl of ice water to stop the cooking. From there you can drain it and stick it into bags fit for the freezer. If you try it, tag me on Instagram at @mynourishedhome and let me know what you think! Heat coconut oil in a large saute pan. Add shallots and allow them to cook 2-3 minutes or until translucent. Add garlic and red pepper flakes and cook for one minute, stirring often to prevent burning. Add kale, broth, and salt and pepper, mix well. Cover and cook for 5 minutes, tossing occasionally. Remove the cover and continue cooking until most of the broth has cooked away. Serve hot and Enjoy! This is a tasty recipe. If you don’t have shallot use a small onion. It gives such a nice taste. Goes great with roasted sweet potatoes and grass fed butter along with a chicken breast or thigh on the bone. Also good with salmon. Thank you so much! I love the flavor! This was so awesome! Good tasting kale? Who knew. I just made this tonight and oh wow! It was so delicious! Thank you for such a wonderful recipe. Question? How much does a large bunch weigh – 8oz., 16 oz., 2 lb.? I only see diansaur kale in small, little bunches in the store. I’ve decided to grow it in my garden along with chard and “large bunch” is different for different people. I’ve been eating this kale for a couple years in my morning protein shake, but I have never thought to cook it. I would also like to know the answer to this, as I have never cooked it either. Hands down the BEST and easiest dish to make! I made it twice in one week! I added chicken stock one of the times and it was awesome! Love it!! This recipe is the best I ever have had. We have fresh kale in our garden as well as green onions. It was very easy to make and so good. The most work was cleaning the kale. Would recommend this kale receipe you will not be disapointed! I have made this for sometime. I load it up with a bit more garlic! Absolutely the best!! Absolutely delicious! Even my 6 year old gobbled it up! This is the best. Quick and easy. The coconut oil gives it such a fresh taste. My new go to veggie. It is usually about a pound but most grocery stores will wrap or band together one “bunch” of kale for pricing purposes. A bunch is a loose term but usually is about a pound. Tried it with some penne pasta and olive oil and it was perfect! It really balanced the texture and flavor. Hello! My family loves kale but I only make it as kale chips and haven’t really looked for any other recipes. I came across this one on Pinterest and have to try it. We eat LCHF so I will grill up some boneless chicken thighs to serve on top of this dish as a base. Yum! Thank you for sharing! Made this for dinner tonight, unfortunately I oversalted it. I added a little bit of ricotta cheese and a little bit of nutmeg to fix my mistake, turned out to be pretty good. Creamy kale. I’ll try again. As a child, kale was never on our menu. We only ate collards. However, my Son and his wife live in Central South Carolina where Kale is very abundant and they eat it regularly. I am loving this recipe. I love this recipe. I have had it 3 of the past 4 nights for dinner. Thank you for sharing!! I had some kale that I did not know what to do with. I tried this recipe. It was easy and delicious. Will be doing this one again and again and again. Thank you! I love this recipe too! I am so glad you like it! 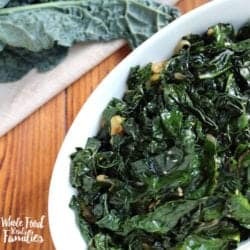 My go-to kale recipe! TY! !